The love of books, the legacy of friendship. What is a bothy, you ask? It was new to my vocabulary as well. It is a term that comes from the isolated mountainous areas of Scotland, Northern England, Northern Ireland and Wales. Having lived in Northern Canada, I recognized the definition, even though we have different names for this open-door policy in remote areas. A bothy is a basic shelter, usually left unlocked and available for any wayfarer to use without cost. In cold climates there is always need for shelter, a place to stay warm while winds, rain and snow play gleefully outside. 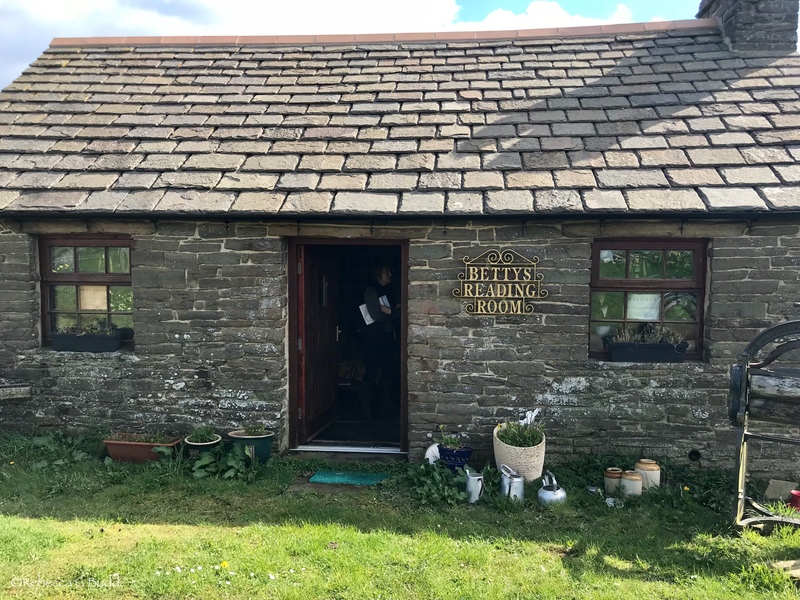 Betty’s Reading Room is located by the small ferry terminal in Tingwall, a tiny settlement on the north-east coast of Orkney’s West Mainland, which looks across the Gairsay Sound to the islands of Gairsay, Wyre and Rousay. 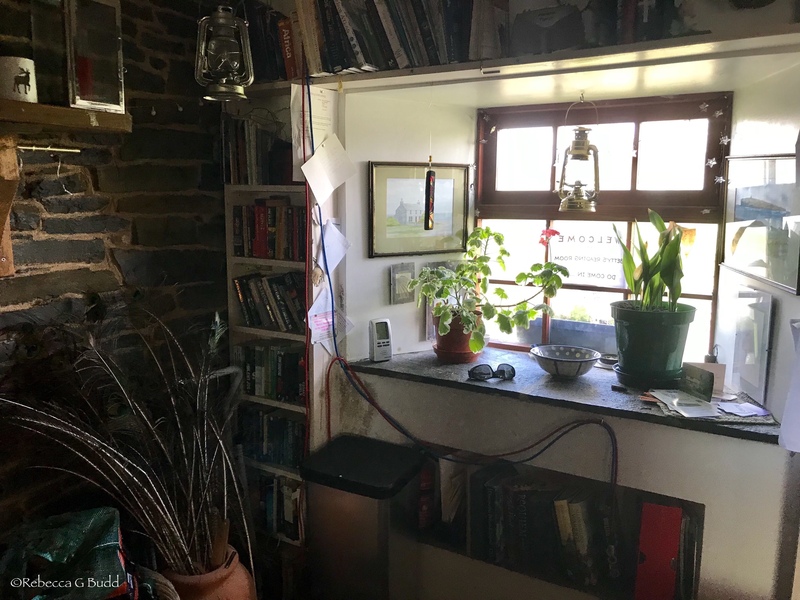 Craig Mollison and Jane Spiers chose to breathe life into a derelict bothy, as a tribute to their beloved friend, Betty Prictor who passed away unexpectedly in 2007. April 2012, Betty’s Reading Room was opened to travelers waiting to catch the Ferry. A Reading Room – what better way to remember a dear friend by creating a space that would encourage the love of reading. The invitation to borrow books, even keep books from the collection, is open to all. Every year, on the first Thursday in March, the United Kingdom and Ireland celebrate World Book day. Today, from my home in Vancouver, I share that special day with my friends from across the “pond” by reading the poem by Julia Donaldson that was on the wall at Betty’s Reading Room. 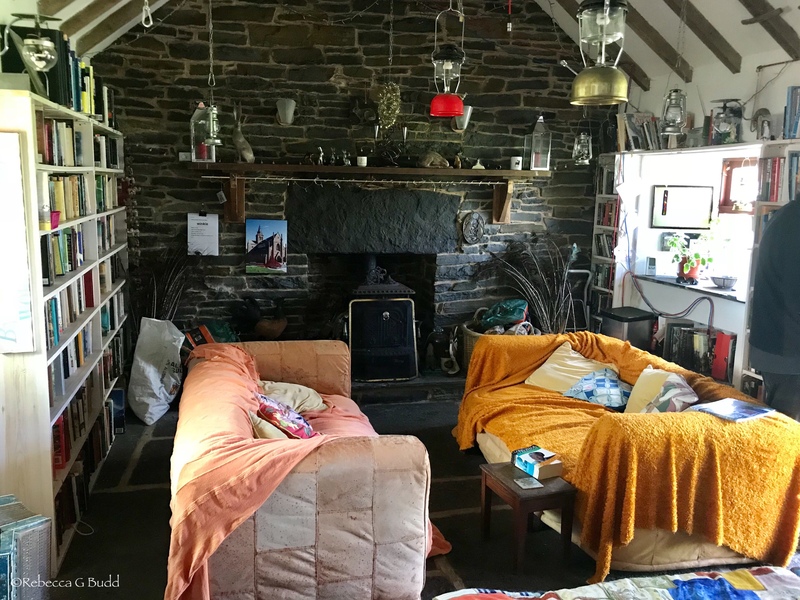 Betty’s Reading Room, Tingwall, Orkney from Rebecca Budd aka Clanmother on Vimeo. What a lovely and cozy place, one more popular now because you shared it with us! 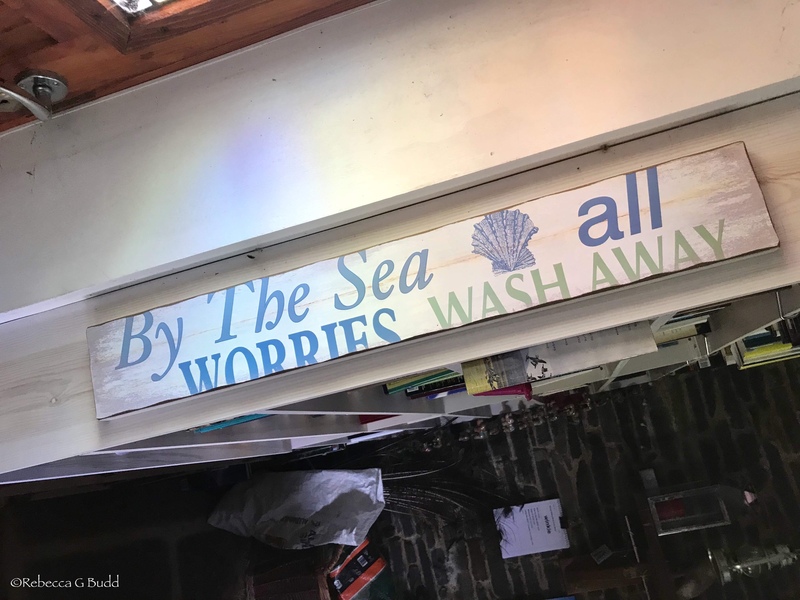 Ah, it’s always great to read your posts, especially when I can return and load the pages with the images and appreciate them a second time – then a third when I am home again and can view them in a proper reading setting! Seeing the notification for your posts is like receiving an old-fashioned letter in an old-fashioned mail box! Don’t ever stop blogging! How wonderful to hear from you, my dear friend. I marvel at your creativity and ability to communicate your extraordinary insights within the context of your compassionate community. We need to build these types of communities (villages) wherever we go. Thank you for creating an on-line space that celebrates the artist in all of us. Hugs and love coming your way…. A very beautiful post-and educational. This is a special place and I would love to visit it. But, I have had a very good look and experience from this read!. Can you imagine how happy this little reading room would make Betty. A very unique memory! I like the poem you have included, as well. Thank you for sharing. I am delighted that you joined me at Betty’s Reading Room. 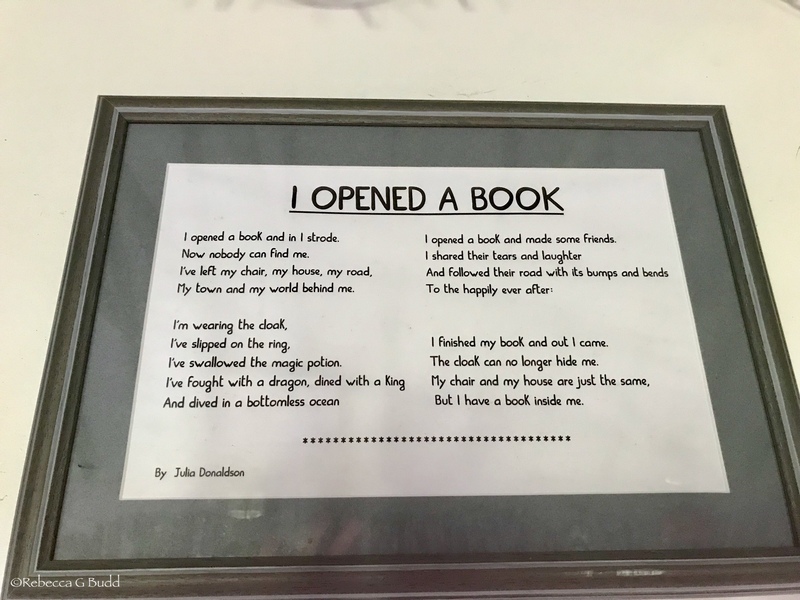 My most profound takeaway from this experience was that books connect our lives and give meaning to the ideas, hopes, aspirations of humanity. We are not confined by location or time. The world of past, present and future are ours to hold, even for a brief moment. And the sustaining power that keeps us every fresh, and open to new possibilities is love. Love for ourselves, each other, our world and all who share this wonderful home with us. That is the perfect time of year to visit. There are so many exiting places to visit in Orkney. I’m looking forward to your photos. Always, always an adventure. What an absolutely lovely post! What a wonderful experience! Thank you, Mary Jo! Have you ever noticed that unforgettable moments come unexpectedly, as a gift and a call to action that we must be ready to respond to a story unfolding. When we do, we add to the narrative. I am so glad that we have connected. Thank you so much for sharing the story of Betty’s Reading Room. Your pictures and words take me right back to that special place. This is such a lovely post to celebrate World Book Day, or any day for that matter. Thank you, Gallivanta. I have a list of all my favourite libraries – and Betty’s Reading Room is at the top. There are many stories held in the pages of books, but I am finding that libraries have a unique story. So I’m on a quest to find those stories in the coming month. There is always an adventure waiting….